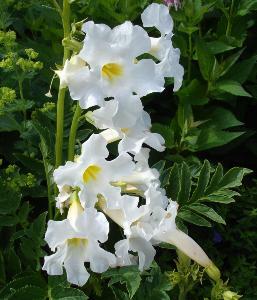 Incarvillea delavayi 'Snow Top' is a perennial with spectacular flowers. Stout stems bear large exotic trumpets of snowy-white flowers in June-July. The flowers appear with the deeply divided leaves. Prefers full sun and well drained soil. Hardy. Height 0.60m, spread 0.30m. Supplied in a 9cm pot.